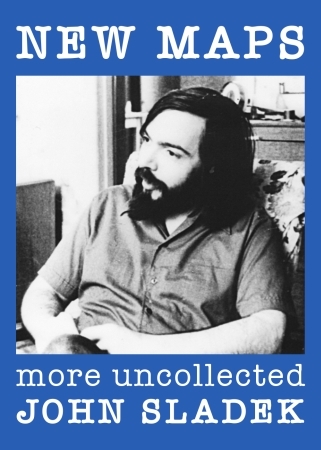 New Maps: More Uncollected John Sladek was released by Ansible Editions in April 2019. 98,000 words. Trade paperback 9" x 6", 255pp, ISBN 978-0-244-15877-4. $20 plus local postage from Lulu.com: click button below. Ebook to follow in the usual formats at £5.50 (button to be added below). New Maps complements Maps: The Uncollected John Sladek, also compiled by David Langford and published by Big Engine in 2002. Maps was an attempt to bring together all John Sladek's fiction that had not appeared in the collections published during his lifetime. (Click here for a full description, with contents.) Now New Maps does the same for his nonfiction. Actually it's a little more complicated than that. Besides stories, Maps included some autobiographical nonfiction. Besides a great many newly collected essays and reviews, New Maps includes further Sladek stories, characteristically weird non-stories and graphic features that came to light over the years since Maps in 2002. Click the "Contents" button below for the full New Maps contents list.